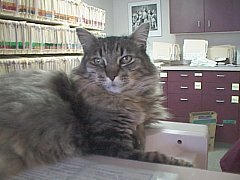 Charlie is the most well-known cat at Lien Animal Clinic, because he is almost always in his basket on the counter, ready to greet clients and receive pets from them. He was born in 1985. 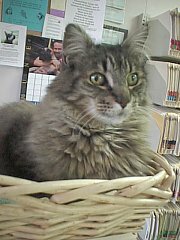 He was a stray that one of the customers brought in, maybe about 2 years old at the time. He loves attention and treats, and will beg for both. Dogs don't bother him at all. He is a very nice boy, always ready with a purr. 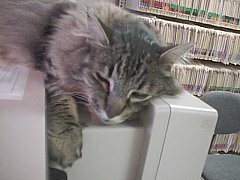 When I came in I found him asleep on the computer, his fur all toasty warm. Charlie works with Eddie Higgins, Jake, and Biff. He is a retired blood donor. Note: it was reported by one of Charlie's admirer's that he passed away sometime early in 2003. 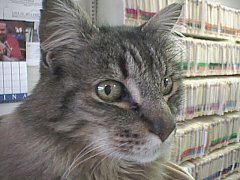 He will be missed by everyone at the clinic including the other cats.